I've blogged about serving fried chantarelles on toast two years ago, but as the chantarelle season has began here again and I've been eating fried chantarelle mushrooms several times a week, I decided to blog about them again. The summer lunch of boiled potatoes and fried chantarelles is a classic, a side "salad" of cottage cheese and fried chantarelles is another current favourite, as is this bruschetta-style small toast. Lovely with a glass of chilled white wine or beer on a summer afternoon! I love pairing chantarelles with dillweed, but thyme or parsley would work as well, as would summer savory. Clean the mushrooms, halve or quarter the larger ones. Heat some butter and oil on a frying pan. Add the onion and gently sauté for 5-7 minutes, until it starts to soften. Add the mushroomsn and fry for a few minutes, stirring occasionally. Add the crushed garlic clove, season with salt and pepper. Finally stir in the dill. Fry the bread slices in oil and butter until golden on both sides. 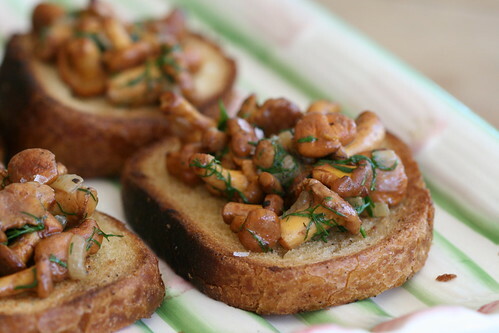 Divide the mushrooms on the bread slices, sprinkle some sea salt flakes on top and serve. I was wondering on some new idea. GREAT idea! I'm going food shopping today!!! Thia looka ao good; I have to try it; thanks.